Robert Wells and I entered a strip we did together called Body Pop into the Strip Magazine Challenge and we won. 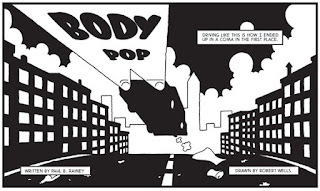 This means that Body Pop will be appearing in issue six scheduled for release sometime in April. In the meantime, here's a sample of Robert's art from the story. Richard Bruton reviews the first two Thunder Brother: Soap Division stories, The Apprentice and Going Straight, for the Forbidden Planet blog. 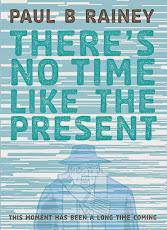 "Rainey perfectly plays off the bizarre and incredible with the mundane and down to earth stuff, and it’s a lovely concept, all executed with flair and style." With the strip returning here this Sunday, I couldn't have timed this better myself.